Huge contingent in SF LGBT Pride demands "Free Bradley Manning!" 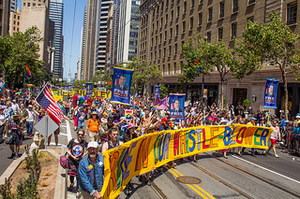 In a huge show of support for imprisoned whistle-blower Bradley Manning, over 1,100 people joined a contingent at the San Francisco LGBT Pride Parade calling for his release. This outpouring was organized by the Bradley Manning Support Network and supported by a wide variety of groups including the ANSWER Coalition, Iraq Veterans Against the War, SEIU Local 1021, WORD (Women Organized to Resist and Defend), Veterans for Peace and many others. Manning, a U.S. soldier and anti-war activist, is accused of leaking evidence of U.S. war crimes and blatant violations of other countries’ sovereignty to the website Wikileaks. He has been held for years under brutal conditions that violate his basic civil and human rights. Manning’s court-martial recently began at Fort Meade, Maryland. As a gay man who took a stand against U.S. war crimes, he is widely admired in the LGBT community. As a reflection of this support, Manning was elected by the Pride Electoral College to be one of the grand marshals for this year’s San Francisco Pride March. However, in an unprecedented move, the San Francisco Pride Board of Directors rescinded his election and issued a pro-military statement attacking his courageous actions. The enormous contingent at Pride was the culmination of community organizing that began immediately after the Pride Board’s decision. The militant energy of Manning’s supporters and their explicitly political message is in line with the origin of Pride in the heroic Stonewall Uprising. After waiting hours for the contingent to join one of the largest Pride parades in San Francisco, the Bradley Manning Contingent stepped onto Market St. to the rhythm of the Brass Liberation Orchestra and spirited chanting. Favorites included, “LGBT Bradley Manning speaks for me. LGBTQ Bradley Manning speaks for you.” The reception from the crowd was inspiring—sections of onlookers joined in on the chanting and cheered on the contingent. Building on the momentum of the recent victories over Prop 8 and DOMA, the Bradley Manning contingent was powerful evidence that the grassroots of the LGBT movement stands in solidarity with oppressed people around the world and will work tirelessly to free this political prisoner.